It has been mentioned before that the basement of my old house contained some strange things, usually pertaining to food. The most famous example (and by “most famous” I mean the only one I can remember) would be the awful assortment of soda I was able to unearth from there. When my family was moving to another state, I did my best do help them out. This mostly consisted of me rummaging around the house looking for things I wanted to take. My ransacking was limited mostly to the basement. Digging through the shelves of food long since forgotten about, I felt like an explorer. I was Indiana Jones, except instead of digging for crystal skulls with which I would disappoint my fan base, I was moving dusty jars around looking for mysterious edibles. From doing so much food shopping now, I realize how much I took this basement for granted. Have you seen how much wheat germ costs? Of course you haven’t; no one buys wheat germ besides my family and probably twelve other people. Well, it’s expensive. What made the basement’s goods so plentiful was the fact that my dad never has the slightest idea of what we have in the house. When he would go to BJ’s, he would buy another 12 pack of paper towels, another gallon of shampoo, another 100 pack of “Good News” Razors (that name being rather ironic given the fact that my neck never receives the news as such), and so on. Another object taking up room in our basement was a rather large blue barrel. It was supposed to do something related to water: filtering, removing iodine, or another cleaning-related function. The reason this large blue obstruction was in our basement was so that we could survive in a post-apocalyptic world after Y2K. Oh yeah I should mention that he bought into the Y2K fears, big time. If you weren’t paying attention around this time (the year 2000), no nuclear wars broke out as a result of computer errors, and no civilizations had to result to cannibalization due to the ConAgra plant’s inability to produce Kid Cuisine. I’m not quite sure what level of chaos he thought the world would be brought to. We would need to survive on food rations as a result of nuclear explosions, yet we didn’t need a bomb shelter? Regardless, I got used to seeing the big blue barrel in the basement, and never really questioned why we kept it. 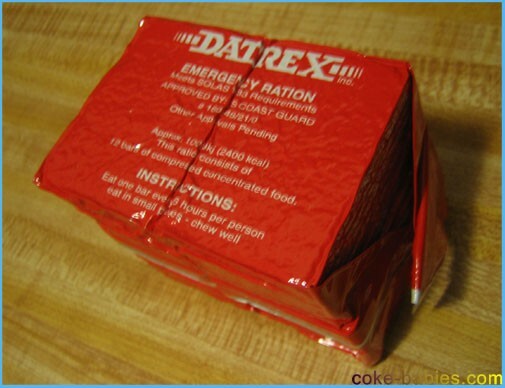 When helping my family move, I saw the other Y2K emergency supplies we had, including pills that helped cure radiation (which I’m assuming didn’t work), as well as emergency food rations. I’ve always been kind of interested in dehydrated camping or MRE type foods. Those things that promise delicious pot roast just by pouring boiling water in a bag, yet probably wind up looking like what happens when you forget to reduce the power to 50% when cooking TV dinners. Unfortunately, we didn’t have any delicious dehydrated beef stew, or even Astronaut ice cream that you know is disgusting but still think is pretty cool. All we had were frightening blocks of “Emergency Rations”. Even though they weren’t pretty, they were still emergency food, so I felt compelled to try them. For science. The rations come packed in a vacuum sealed, red package. In a large font is the company’s name, DATREX, which is pretty frightening. It sounds like the name of a company that would be pumping raw sewage into lakes. In case you wouldn’t be willing to eat something that was not approved by the US Coast Guard, don’t worry, this is. All other approvals are currently pending, which really makes the Coast Guard seem a bit loose with their approvals, but I guess that’s just how they were raised. The label also has instructions on how to eat a bar of food. In case you were unsure. 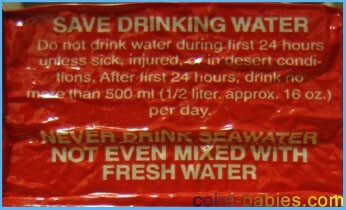 Another fun fact the label offers is that we should not drink sea water. I realized I should never do this when I was about six, and got some in my mouth at the beach. I also realized this later on when I was in Hawaii, and didn’t really have a choice as the violent waves forced about a quart down my throat, forcing me to later vomit. So don’t worry about the sea water warnings. I’m good. You are also told not to drink water in the first 24 hours after an emergency, unless you are sick or in a desert. Or if you are thirsty, I guess, although it doesn’t specify. It also says it is best to not to drink more than two cups a water a day. So I’ll be fine during an emergency, since I normally don’t drink this much water. As long as there’s soda, I’ll be fine. Upon opening the package, I am met with a rather gross looking block of “food”. 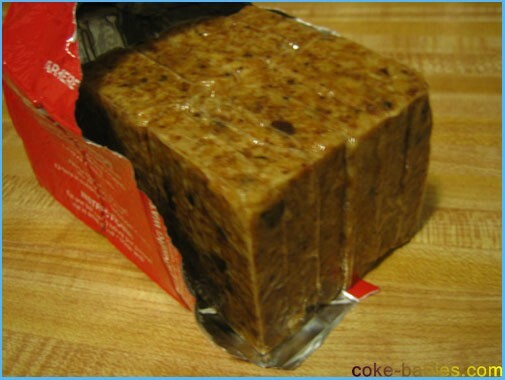 It looks sort of like those healthy breads you see, that are very compressed and are almost like chewy melba toast. Sorry for the awful comparison. I don’t know much about what I’m comparing it to, but I know that it looks like whatever it is I’m talking about. It also sort of looks like when you eat a bowl of cereal from the bottom of the box. Since you pour in all the cereal crumbs and powder, the milk at the end turns into this muddy slop. That is what this looks like. So feel free to ignore that terrible healthy bread comparison. One thing that is immediately noticeable is a greasy, slimy texture to the block of food. It also smells like coconut. Not real coconut, more like a coconut shampoo. I’m not too worried about surviving the night, so instead of dividing it into the correct serving size, I just dig in and take a bite. It is at this point that I realize the food is sealed in cellophane. In all fairness, if the food is still sealed, why is the outside greasy? To aid removal from the foil wrapper? Now to get to the food, I need to use a knife to open the block. I’ll need a knife in an emergency anyway, to fend off coyotes and hobos, so I’m not worried about the tricky ration packaging. The fairly appealing smell is still pretty unexpected. I don’t know what smell I was expecting, but it wasn’t coconut. When you are desperate for just enough calories to live another day, who is expecting a tropical delight? After inspecting the ingredients, the reason for the smell becomes apparent. The list is also refreshingly short: wheat flour, vegetable shortening, cane sugar, water, coconut, and salt. No weird chemicals, everything seems normal. The entire block of food isn’t that big, and each serving measures about 1.5 inches by 2.5 inches, and .5 inches thick. Like a novelty size deck of cards. And at 200 calories, I don’t know how long you would be surviving by eating this. I don’t know what I was expecting, I guess some crazy scientific marvel that packed 2,000 calories into a single bite. When I tasted the ration, I immediately wished there were more chemicals and artificial flavorings. While it smelled like coconut, it certainly didn’t taste like it. It tasted like how Jack Johnson music sounds. Is that a current reference? I haven’t noticed if he has gone away yet. The taste wasn’t bad, it just tasted… there. It was no coconut granola bar, but at the same time it wasn’t human flesh. As far as survival food goes, it wasn’t bad. 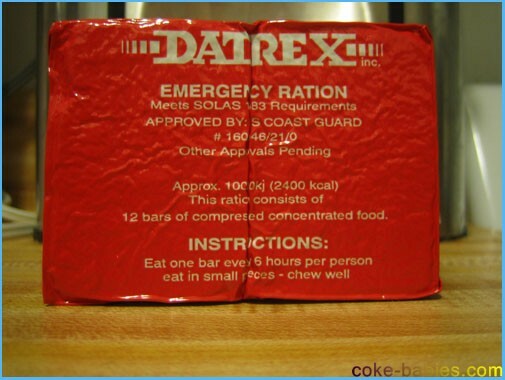 I certainly don’t envision DATREX bars replacing Kudos in lunch boxes any time soon. It may be all natural, but even the most strict parents probably won’t force their children to make the switch. The nutritional facts don’t make it seem like this would last very long in your system. It seems like you’d get the same benefits from eating a handful of All Bran and a couple spoonfuls of Crisco. Whether or not that is more convenient to keep in your glove compartment or bomb shelter is up to you. Hm. When scanning the label to get inspiration for a closing statement, I noticed the expiration date was 9/04. I just assumed that emergency rations last indefinitely, I certainly wasn’t expecting it to expire five years after production. I’m pretty sure that the Creme Savers I have in my car have been in there for at least ten years, and they still taste good. Let this be a lesson to you all: natural food is inferior to chemicals and artificial flavors. Now I don’t fear a nuclear war as much. At least I would finally be able to finish that bag of Creme Savers. I’m kind of sick of the strawberry flavor. I debated whether or not I should open this article with the question, “What is wrong with the Japanese?” Because, let’s face it, that sounds sort of racist. Then while re-watching the movie in order to get screen caps, I was reminded of all the moments in the movie that made me ask myself that question. In the end, it was confirmed that the only way one can start a review of a movie like this is to ask that question. So let’s start over. What is wrong with the Japanese? I’ve always taken much of their media with a grain of salt. Those bizarre commercials that American actors do for some reason, the video game characters with four foot high hair and two hundred pound swords, and their apparent obsession with cartoon girls being sexually assaulted by octopi. I don’t get it. Granted, they probably feel the same way about much of our entertainment, and I understand that. However, once in a while something comes along that surpasses that understanding, and reignites the questioning. 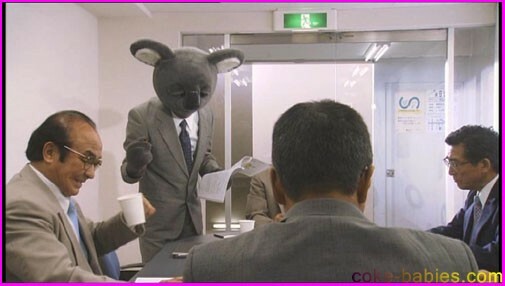 I’m not even sure how I came upon the trailer for Executive Koala. All I know is that after seeing it, I knew what I had to do… watch the movie. Luckily, I was able to find it, since for some reason this movie didn’t wind up with the widest distribution in America. Go for it, Executive Koala! Granted, I don’t have a theme song, so the Executive Koala does have an advantage over me. At the same time, does that song sound like something you would want written about you? Not tempted to commit adultery… yeah great, thanks. Terrible when made angry? This koala just sounds like a normal guy with a bad temper. Hardly song worthy. 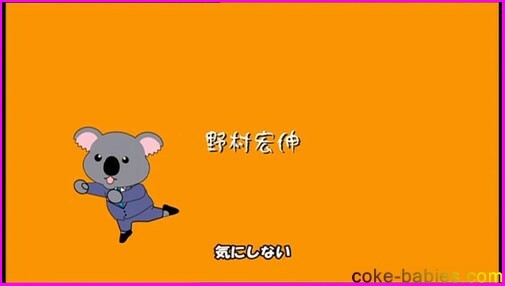 Also, the credits show the koala peeing on a street pole. This guy isn’t off to the greatest start as far as showing his character goes. Of course he knows he can get away with this criminal act, because no one wants to make him angry and terrible. The movie opens at the workplace where the koala gets his executive title from, the Rubbles Pickle Company. Oh and in case you weren’t sure about the title, it isn’t meant as a metaphor. He is a koala. 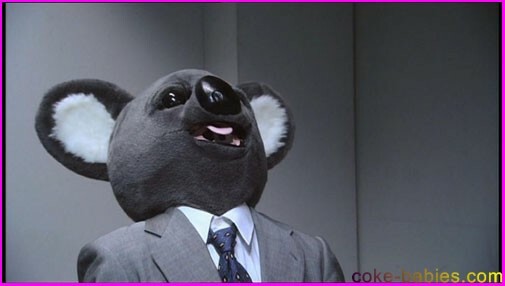 A giant, suit wearing koala. His co-workers know that he is a koala, as they talk about how hairiness is a turnoff, yet they don’t seem to find the fact that he is a koala to be a turn off as well. Tamura insists that it is imperative to sell kimchi, “for the youth”. And I certainly agree. Everyone knows the youth of America demands its pickled cabbage, and the companies that provide it certainly bring in all the big money. Despite this, the presentation doesn’t go too well, as the pickle executives don’t seem as enthralled with kimchi as Tamura is. I don’t know if this is a common affliction among giant koalas, but Tamura sweats lot. He spends the first ten minutes wiping his forehead with a towel, until finally he gives up and wears a sweatband. Which as humans know, totally does not go with a suit. Tamura then goes home with his human girlfriend (gross), and proceeds to keep yelling out his ex-girlfriend’s name in bed. I’m not sure what the girl is getting out of this. You would think that if she is willing to date a giant, hairy koala, that he would at least have the courtesy to not dwell on past relationships. The next day at work, a pair of detectives visit Tamura. When co-workers notice that detectives want to talk to him, the first thing that comes to mind is that they assume he has stolen underwear. It must be hard enough for a koala to get on the corporate fast track, but when you also have a reputation as an underwear thieving deviant, it must get that much more difficult. It turns out the detectives want to question Tamura because they think he murdered his girlfriend. Which, as I have learned from watching Law & Order, is a worse crime than underwear theft. When Tamura objects to being accused of murder, they assume his upset emotions are due to hunger. So they do what is common with hardboiled detectives, and offer him… pork chops. That makes Tamura even more upset, as he claims pork chops are what criminals get fed. That doesn’t seem so bad. I’m not a big fan of pork chops, but I would assume that is a better entree choice than most prison foods. We then find out another one of Tamura’s girlfriends disappeared three years ago. His dating life doesn’t seem to be looking too hot. The next day, Tamura returns to work, where everyone is scared of him after seeing newspaper articles saying he is the suspect in the murder. To calm Tamura down, the CEO of his company calls him into his office to tell Tamura he thinks he is innocent. By the way, the CEO is a rabbit. The detective begins trailing Tamura, hoping to catch him in the act of doing one of his depraved koala activities. He follows Tamura to Tamura’s psychiatrist, where Tamura begins talking about his girlfriend. This results in a montage of their activities, which included dancing in front of a green screen, possibly making a music video at Six Flags. Tamura starts crying about his girlfriend Yukari. To be more accurate, he continues crying about her, since he tends to cry a lot. After Tamura leaves, the detective asks the psychiatrist questions about Tamura. For some reason, the psychiatrist doesn’t want to answer personal questions about his patient. Tamura then meets with Mr. Kim, to discuss the big kimchi deal. After taking Kim on a tour of Japan, Tamura gets attacked by a squirrel that Kim was carrying in his bag. At this point, I’ve stopped questioning why things are happening in this movie and why it is accepted that they can, because I’ve already been broken down by the ridiculousness. It also helps with the next part, where Kim demonstrates martial arts moves as a way to thank Tamura for his hospitality. Instead of Kim demonstrating the moves where they are, they go to a dojo and change first. We then go into another montage, this time involving Kim’s martial arts, kimchi, and what looks to be bacon. Again, it’s better to not ask questions and just accept it. Kim then tells Tamura that if Tamura doesn’t hit him with a stick, they will not agree to the contract between the two companies. You know, just as most business deals get done. After the meeting, they go out to a club, where Kim is treated like a celebrity. I don’t know what the deal with how the Japanese feel about Koreans, because I’m ignorant, but they seemed to go a bit overboard. If I was at a restaurant and saw someone from Canada (or Korea for that matter), I wouldn’t get excited and want to take his picture. Okay, I might a little, but not that much. Kim tells Tamura that he used to date Yukari, Tamura’s missing girlfriend. Or maybe she’s the one that’s dead. Or maybe she’s not an ex and is just the one that’s missing. I’ve honestly lost track at this point. Kim shows Tamura a picture of Yukari, showing her all beaten up. According to a letter written by her, Tamura is the one who beat her up. Surprisingly, Tamura doesn’t cry this time, but he does get a bit indignant at the accusations. 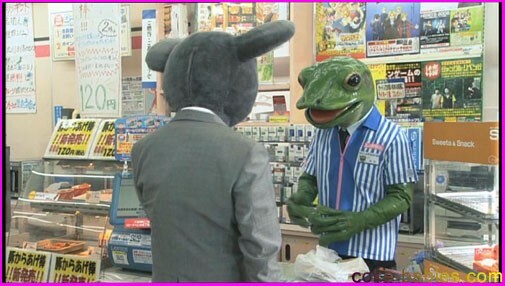 The next day, Tamura goes to a deli, which is run by a frog. Why not? At the same time, the detective goes to Tamura’s home town, to ask questions. Unfortunately, when his villagers see a picture of him, they get frightened just by his appearance. It could be assumed that the fear is because he is a giant koala, but we are meant to believe the fear is due to something else. Next there is a montage (of course), this time a dream sequence where a beat up Yukari tries to kill Tamura. Tamura somehow gets Terminator eyes, winds up killing Yukari, then goes after his psychiatrist and one of his coworkers. Of course, this doesn’t mean anything towards the plot and is just filler. Really, really long filler. After Tamura kills his coworker, all of a sudden the director yells “Cut”, and we then see the cast and crew. I don’t want to see that! Come on, I was really starting to believe that suit-wearing koalas can exist, now you’ve ruined the illusion, forcing me to realize that it’s actually just a costumed guy with those long Asian sideburns. I know at this point I should stop saying I’ve given up on attempting to understand what’s going on. However, this movie just keeps managing to top itself with irreverent nonsense that demands pointing out. And then, SHOCKINGLY, Tamura wakes up… it was just a dream! Wait no it wasn’t, there is the undead corpse of Yukari! Oh wait, now he’s woken up from the dream. I think. The next day, Tamura goes to visit his psychiatrist and is surprised to find his CEO sitting with him. One can understand why Tamura is so shocked, I sure as hell wouldn’t want to find out that my boss has been talking to my psychiatrist. Not that I need a psychiatrist of course. Just… in theory I wouldn’t want that to happen. This leads us into expository dialogue that they don’t even attempt to cover with another plot device, it is just them explaining point blank the history of Tamura. He is actually the founder of Rubbles Pickles, and was a very energetic worker. However, he took his energy home, beat on Yukari and apparently put her on a leash to eat off the floor while he drank beer. It is then revealed that Tamura actually did kill Yukari. Tamura asked his psychiatrist to take her body into the woods and burn it. And since psychiatrists do that kind of thing, he did. Tamura then had his memories of killing Yukari replaced with good memories, like that time they made a music video at Six Flags. When Tamura goes to turn himself in, he is met with resistance from his boss and psychiatrist. They are worried that this will lead to the downfall of Rubbles Pickles. Their concern is understandable. Can you imagine what would happen if one of our beloved pickle companies collapsed? There would be anarchy and rioting in the streets. Because of this, Rubbles Pickles could not be allowed to go out of business. The CEO injects Tamura in the neck, and makes him pass out. Next we are in the midst of Tamura’s trial. Since Tamura was knocked out so he wouldn’t go to the police, I’m assuming this trial is meant to be a dream. But given the other events in this movie that actually happened, I won’t write this off as a dream just yet. Tamura is put on trial for murder. This trial, of course, is represented by a musical montage. The witnesses tell the tale of how Tamura tormented them, stealing and threatening them every day. Instead of speaking their story, the witnesses sing and gyrate around. Personally, I wouldn’t put much faith in what these people had to say, but it’s quite possible that the legal system over there is different. According to the witnesses, Tamura was a real prick. He punched an old women in the face and robbed her, and when she told his parents, they burned her house down. Also, he raped three girls in high school. It’s really getting hard to find Tamura to be a sympathetic protagonist. In fairness, the story from their next witness was suspicious. He and Tamura bumped into each other, and they started fighting. But the other guy threw the first punch, and Tamura fought back. Now he’s whining that he never recovered from the battle. Tough luck, wimp. Next time don’t start a fight with a giant animal. So yeah, it was a dream. Surprise. When Tamura wakes up, he is relieved to find out it was a dream. What he isn’t relieved to find out is that he murdered his psychiatrist and his boss, and wakes up to find this out just as the detective walks in. Admittedly, that does look pretty suspicious. Tamura is then taken to Alcatraz (huh? ), where his cell mates hold him down and jump on his chest and steal his food. 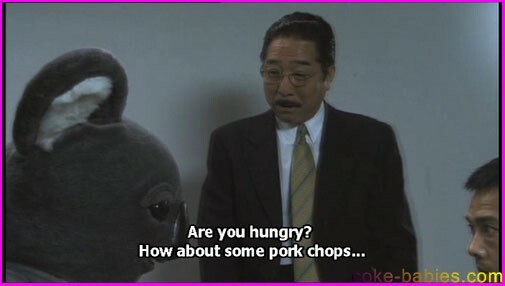 Although it isn’t pork chops, so now I’m even more confused as to why the detectives offered them to Tamura earlier. It’s been almost five minutes, so that means it’s time for another dream sequence. 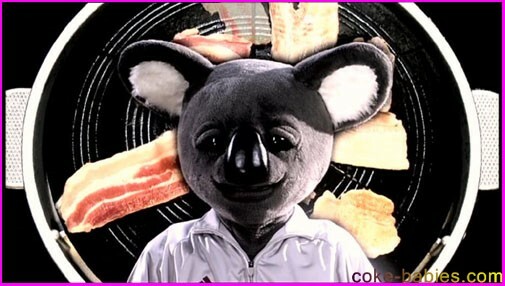 I’ve learned you can tell it’s a dream because that’s when he turns into Terminator Koala. In the dream, he kills everyone in his cell and some policemen. Tamura realizes that today is the day he promised to meet Yukari one year from proposing to confirm that their love is eternal, or at least good for one year. He is depressed that he can’t escape until Kim’s squirrel shows up at his window with the keys. Of course. 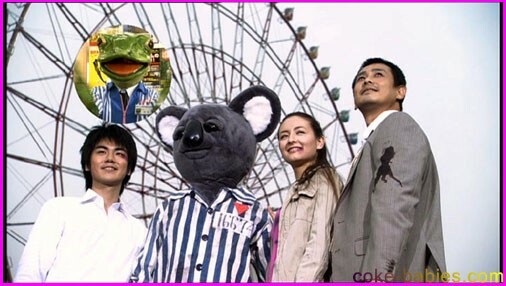 When Tamura goes to the amusement park where he promised to meet Yukari, he is surprised to see Kim and surprised that Yoko is still alive. Her is also surprised she is pointing a gun at him. Then it turns out Yoko is Yukari. They explain that Yukari is the reincarnation of Yoko to get revenge on Tamura. But really they could have just said that Yoko was Yukari the whole time and I would have believed it. It’s actually one of the less strange things in this movie. Yukari explains that she practices the same martial arts as Kim, which teaches resurrection. Which I’d assume is a hard thing to teach. It’s also probably hard to know if you learned it or not, because if you didn’t you’re still dead. Tamura begs Yukari to think of “that single time” when he proposed to her, which makes sense because then she wouldn’t be thinking of the times he beat her, put her in a leash, and killed her… twice. Yukari shoots Tamura, but the bullet is taken by the detective, who jumps in front of the shot. The detective came because he found a witness who saw that Tamura didn’t kill his boss and psychiatrist, and that it was Kim and Yukari. Or, as the detective said, “It was them!” Yeah, we know that already. Tamura is pissed, not only because Yukari killed the detective, but also because 100 years ago humans killed a bunch of koalas. Oh, now you’re interested in koalas? You’ve spent your whole life trying to be more human, you can’t have it both ways. You either side with the humans or side with the koalas. I also must doubt the accuracy of Tamura’s accusations, I just don’t see why humans would crucify koalas, it just doesn’t seem time efficient. Although that koala hat is kind of cool, it looks like those Stitch hats they sell at Disney World. Tamura’s got the Terminator eyes, but I think this time it actually isn’t a dream, and it is his koala rage that is making his eyes glow. And while this isn’t a dream, it certainly is another (you guessed it) montage. This time it is a long fighting scene, but unfortunately watching a woman and a giant koala fight isn’t nearly as entertaining as you would think. Although at one point Tamura swings Yukari by her legs while hitting her head, repeatedly, against a metal pole. 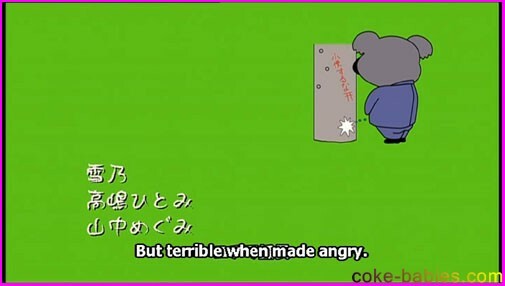 Terrible when made angry, indeed. After smashing her head against a metal pole (in case you forgot), Tamura then throws Yukari up in the air, allowing her head to land on concrete. She then does that martial arts things she does, to resurrect herself. Just to clarify… if she had to use resurrection, that means Tamura killed her. Again. Tamura beats Yukari up some more, presumably because he had so much practice during their relationship, and I think kills her again. In either case, it is now time to fight Kim. And fight they do. For a long time. I know continuing to bring this up may border on redundant but I do feel I should point out that this fight scene involves a six foot koala. Kim gets beat up, uses resurrection (which means Tamura killed someone again! This is the least likeable koala ever), and eventually the fight scene just fades to black. It is now morning, and all three of them are laying unconscious on the ground. They all wake up, look at the sunrise, and start laughing. No hard feelings. Tamura then proposes to Yukari, and she says yes! Hey Yukari, you see those bruises on your face? They’re from Tamura punching and kicking you. And killing you! Multiple times! Then, of course, the detective gets up, he’s not dead either. They all come together, stare off towards the future, and realize everything is going to be okay. And just in case your attention drifted for half a second and you thought that maybe you were watching a normal movie, the frog pops in to remind you that no, you are not. Hopefully, there is no lesson to be learned from this movie. Because any lesson you could take away would be a terrible thing to learn. Feel free to lead a life of abuse towards others, especially domestic abuse, that’s awesome. And if you happen to kill your girlfriend, don’t worry. If you happen to kill another one, don’t worry either. And if the first girlfriend turned out to be the second girlfriend and you kill her again, it’s okay. She will still marry you, and you will live happily ever after. Of course, you will be the only one living happily. She will be miserable due to the constant beatings and leash-wearing, but eventually that will end, because you will kill her for about the sixth time. Farewell, Executive Koala. You are officially the strangest movie I have ever seen. Your combination of adorable giant animals, brutal violence, and unrestrained use of montages may never be topped.